Sir John Betjeman (1906-84) was a lifelong railway enthusiast and a frequent visitor to Norfolk with a passion for trains, churches, landscape and architecture. In 1962, one hundred years after the Kings Lynn to Hunstanton railway opened its terminus by the sea, John Betjeman travelled on the 12 mile branch line by diesel. ( The design of the two-coach train allowed for a 270-degree panoramic view for those sitting near the front ). Interestingly, he was on his way to the home of Alison and Peter Smithson’s Hunstanton School which was completed in 1956 and is one of the most celebrated Modernist buildings of the mid 20th century. 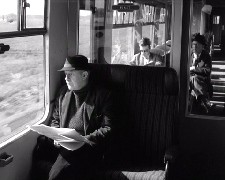 British Transport films recorded his epic journey in collaboration with BBC East Anglia: entitled John Betjeman goes by Train. This engaging ten-minute black and white film was a relatively early entry in Betjeman’s filmography but remains an absolute classic to this day, and is currently available from bfi. Along the way, Betjeman revels in the pleasures of the journey itself, the passing scenery and architecture, and the attractions of the intermediate stations of Snettisham and in particular Wolferton, before ending up at the buffers of Hunstanton, which directly faced the beach opposite the green with its Town Hall. George Skipper was the architect of Hunstanton Town Hall of whom Betjeman said “He is to Norwich what Gaudi was to Barcelona.” So, has Barcelona anything to rival Hunstanton Town Hall? The immaculately-maintained Wolferton Station, close to the royal Sandringham estate, is an architectural gem, based around an arch dating from the late fifteenth century, that JB describes, in his inimitable style, “different from all other stations”. He highlights the way everything has been calculated to blend into the surroundings there are no posters, and the signal box matches the adjacent cottages. 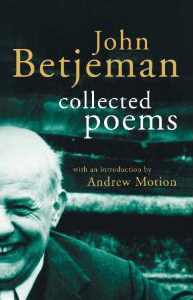 In 1988, four years after his death, The Betjeman Society was created with a mission to promote the study and appreciation of JB’s life and work by bringing together all those who admire his writings and share his enthusiasms. Today there are close to one thousand members and an annual programme of events which includes poetry readings, lectures, discussions and visits to places associated with Britain’s best loved and best-selling poet. 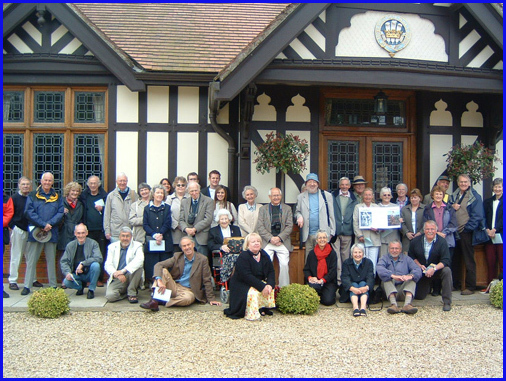 On Saturday June 11th, 2005, The Shires Branch (launched in 1997), one of seven current branches of The Betjeman Society in the UK, organised ‘A Day Return to Norfolk’ for its members. The proceedings began at royal Wolferton Station, where estate manager Jim Holland, welcomed thirty odd enthusiasts with an introduction on the platform. Shires Branch chairman Baz Morris then introduced presentations from key branch personnel, including Pamela Tawse, an ex Barts Hospital Nurse who knew Betjeman, and John Langford, a railway aficionado. Pamela recalled memories of her fascinating early childhood spent in Norfolk, where her father was a golf professional, and recounted how, as a local schoolgirl, she lined the route as the late King George’s coffin was brought to Wolferton Station from the Sandringham estate on a gun carriage. John gave an amusing and informed talk on the history of the branch line. After a group photograph outside the station, the party’s day continued with a seaside lunch, before a tour of Sandringham House and Gardens, with a closing address in the royal church by Horace Liberty, the new editor of The Betjemanian, the Society’s annual magazine. In another film made in Norfolk: A Passion for Churches, John Betjeman applies a wry but affectionate scrutiny to the churches, clergy and parishioners of the county. Originally a classic BBC documentary (now available on DVD) it is a touching eulogy to both the splendour and simplicity of English parish life, narrated by the late poet laureate. There is a memorable sequence featured in the film with a visit to Sandringham church. John Betjeman loved trains not just for themselves, but because they were a wonderful way of travelling through Britain and looking out, without ever having to drive, at ever changing townscapes and countryside. His poetic output may not have been as prolific if it were not for trains, as many of his famous stanzas were begun with jottings on cigarette cartons during steamy journeys in smoky railway carriages. ‘Distant View of a Provincial Town’; ‘Pershore Station or A Liverish Journey First Class’; ‘Great Central Railway’; ‘Dilton Marsh Halt’ and ‘A Mind’s Journey to Diss’ all poignantly evoke memories of a bygone era. And there are many more! Then there are poems about Norfolk. In ‘Norfolk’ he recalls his early years when his father owned a yacht on The Broads and where the family spent their holidays in the East of England, aside from his beloved Cornwall. In his poem East Anglian Bathe, JB fondly remembers Horsey Mere. His verses about ‘Lord Cozens Hardy’ were created “in the very cold train last night”, he told his friend Lady Harrod in a letter from his home at 43 Cloth Fair, London, on December 12th 1955. Betjeman had opened an exhibition of works by his great friend and fellow Oxford graduate, Osbert Lancaster, at the Castle Museum in Norwich, and he and his wife Penelope and the Lancasters had stayed with Roy and Wilhelmine Harrod at Bayfield Brecks, near Letheringsett. Wilhelmine Harrod and the Reverend C L S Linnell were the co-authors of ‘The Shell Guide to Norfolk’ ( 1957, 1964 and 1966 ) : JB was the General Editor. A framed copy of ‘Lord Cozens Hardy’ signed by JB hangs in the Kings Head pub in Letheringsett to this day. The network of railways that once intersected the county of Norfolk have now largely disappeared following the major culling of lines by the infamous Dr Richard Beeching in the nineteen sixties. Betjeman wouldn’t have known at the time that the Kings Lynn to Hunstanton branch line had less than a decade to run, making his film even more nostalgic than even he intended. The line closed on 5 May, 1969. John Betjeman was an active preservationist, unsuccessfully campaigning to save the Euston Arch, but successfully saving St. Pancras station. There is a bronze statue of him by Martin Jennings, now standing proudly on the platform of St. Pancras International, the new Eurostar terminal. He was a leading activist in the re-opening of closed railways, becoming the first President of the North Norfolk Railway, ‘The Poppy Line’, that is now a major tourist attraction running from Sheringham to Holt. The marvellous ongoing regeneration of Wolferton Station, thanks largely to the efforts of its proud owner Mr Richard Brown, helps to create a present link with that glorious past. Colin Wright, 6 St Annes Road, Shrewsbury, SY3 6AU. with kind permission of the BFI National Archive. This film is included on the BFI British Transport Films DVD compilation ‘On and Off the Rails’. It is also available from the BFI Download Space. or purchase BFI DVDs, please follow the links below.